The world's best screen capture program just got better. 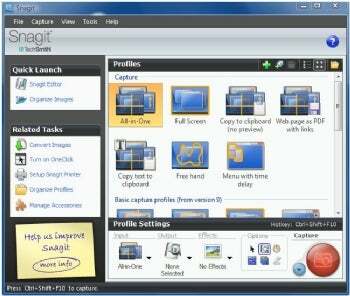 Even before the new version 10 of Snagit ($50, 30-day free trial), the program sported the most comprehensive feature set of any screen-grabber. Even in Snagit version 9, you could capture specific regions, windows, a full screen, scrolling windows, menus, entire Web pages, and videos. Pretty much whatever you could see on your screen, you could grab. And it featured plenty of options as well, such as a capture timer, the ability to choose whether to include cursors, and more. And there were plenty of editing tools as well, notably tools for annotating screen captures. Among Snagit's new features are dressed-up menu icons and the All-in-One capture tool.